← Another El Niño on the way? Three million sheep died in the severe winter of 1947. According to Erwyd Howells, hardy weather-beaten shepherds were reduced to tears at the loss of a life’s work and finally beaten by the weather. And it wasn’t just the snow. Tony Evans recalls that getting water for their livestock was especially difficult because the water supply kept freezing. His parents would spend all day battling to look after their animals. 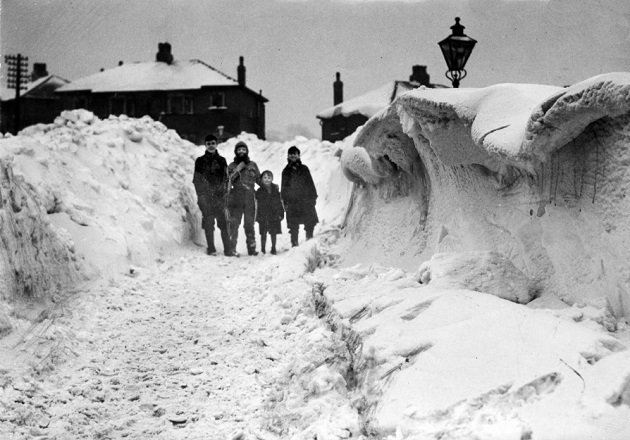 The winter of 1947 brought challenging conditions for many across the UK, in town and country alike. Picture courtesy Bolton News. Janet Henthorn’s brother was born as it started to snow in January. Mother and son were eventually able to tackle the journey home to the family’s remote smallholding. At the top of the first field, her mother stopped to check on the baby, who was wrapped in a fur coat, and found to her horror that he was no longer there. She hurriedly re-traced her steps and near the bottom of the field lay Janet’s new brother – a little cold, but unhurt. It didn’t deter Janet’s parents – they had two more girls and another boy – but not one was born in January. The snow made it impossible to get milk from John Thomas’ family farm to the processing plant, but the excess milk was put to good use by his grandmother. She made butter and cheese and there was still lots of milk to drink for the three generations of family and farm workers trapped by the snow. Lord Henry Plumb who was 22 years old at the time, recalls using his tractor to deliver bread straight through the first-floor windows of the houses in his local Warwickshire village. This was just after the Second World War and people were used to helping each other. And villages were more self-sufficient then, many with a local baker and butcher. Then came the thaw. The flooding which ensued significantly affected the East Anglian Fens: Rex Sly’s home. Food was already in short supply and faced with the prospect of not producing a crop from the following harvest, the government drafted in troops and thousands of pumps to repair breaches in banks and to get the water away. Almost all the Fens were sown with crops that spring, an extraordinary triumph over adversity. The Met Office would like to thank the following NFU members for sharing their memories of the 1947 winter: Tony Evans (Essex); Janet Henthorn (Lancashire); Lord Henry Plumb (Warwickshire); Rex Sly (Lincolnshire); and also Erwyd Howells (Ceredigion); and John Meredith and John Thomas (Glamorgan). This entry was posted in Met Office News and tagged agriculture, farming, February, Met Office, Met Office Hadley Centre, National Farmers Union, snow, weather, winter 1947. Bookmark the permalink.